Spokespersons for Sarah Palin and Tea Party groups have bristled at the suggestion that their violent rhetoric may have contributed to the recent shooting in Arizona that left six people dead and Democratic Congresswoman Gabrielle Giffords in critical condition. The topic is, for the most part, being treated with kid gloves in the press, and the “terrorist” label is conspicuously absent from the discussion. However, animal rights and environmental activists have been labeled as “terrorists,” and sent to prison, for much, much less. 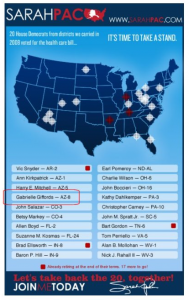 The murder attempt of Gabrielle Giffords needs to be put in a political context: Sarah Palin’s PAC used this map with gun targets on lawmakers, including Giffords; Palin has repeatedly used the rallying cry “Don’t Retreat, Instead – RELOAD!”; Tea Partiers have carried assault rifles to political rallies; and militia members have urged followers to vandalize the offices of politicians (including Giffords), which they have done. To draw an even more specific comparison: the SHAC 7 were convicted of “animal enterprise terrorism” for running a website which posted the names and addresses of individuals tied to the animal testing lab Huntingdon Life Sciences. They were not charged with any act of property destruction, they were charged with “conspiracy” on the grounds that they should be held accountable for the actions of others in the same movement. To be clear, I am not arguing that Sarah Palin should be accused of terrorism. However, such a stark hypocrisy needs to be addressed. If Sarah Palin cannot be held responsible for the actions of those who visit her website, neither can animal rights activists. And if animal rights activists are terrorists for running a website listing “targets,” then Tea Partiers and Sarah Palin, who have gone much further, must be labeled terrorists as well. UPDATE: Well, it was only a matter of time. At least one person is proposing prosecuting Palin as a terrorist and using the SHAC 7 case as justification. It’s this type of sweeping application that SHAC 7 attorneys have been warning about for years.